1. Newly pictured Khangtsen new Hostel Block at the farmland. The paintings and the leveling of the grounds are being progressed with JCB. The First and 2nd Block ground floors are nearing completion. However, our mission is not yet accomplished, and going ahead with it. 2.Mrs Denise Vestine ( Dechen Dolma) and her daughter Bianca and Mrs Ingrid Morangui from Sweden visited Khangsten on January 2010. Geshe Palden, Tashi, Khechok, Tenzin and Mrs Denise Vestin being discussed about the upgrade and improvements of the Sera Jey Ngari Khangsten Website in the Khangtsen office. They also visited the Hostel construction site and impressed by the progress. 3.Ven. Lobsang Choedak( Lharam Geshe ) was conferred the Geshe Lharampa Degree by the Monastery on 19th Dec, 2009. He has successfully completed the six years Gelugpa Board Examination and made extensive feast offerings to Sangha members on the same day. 4.On the very auspicious day of Gaden Nyamchoed Chemo on 11th Dec, 2009, Ven Geshe Tsewang Dorjee( Lharam Geshe ) of Ngari Khangtsen was appointed the new Chief Disciplinarian of Sera Jey University for Advanced Buddhists Studies and Practices. It is a first of its kind from the Himalayan region of Ladakh to hold this post in Sera Monastery since the re-establishment of settlement in India. The traditional scarves are being offered to Geshe la on the ceremonial occasion. 5.Venerable Khentrul Rinpoche from States paid a gracious visit to Ngari Khangtsen in Nov, 2009 with Ven Monlam la and Mrs. Susan. 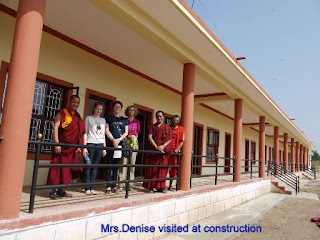 They visited the Housing sites with Geshe Palden and were really delighted to see the progress we made in the hostel building for the monks students. Rinpoche made extensive Puja offerings to the congregations at Khangtsen. 6.Mrs Lena Liu from California visited Khangtsen in Oct, 2009. 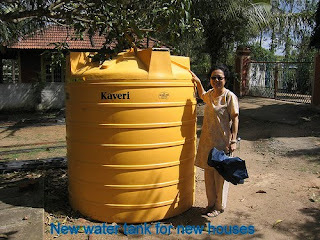 She visited the hostel building site and Ngari Khangtsen’s Mess with her friends. They distributed sweets and educational materials to the young children of Khangsten with compassionate care and loves.